Pillars of Society, Ibsen’s first major prose play (1877), explores the boundless ambition fostered during the industrial revolution and exposes the smug self-righteousness and hypocrisy of the Victorian middle class. Karsten Bernick, a successful, shrewd and calculating shipbuilder, has made himself the benevolent benefactor of his community, while ruthlessly taking advantage of the cheap labor available in this small seacoast town. In order to maintain his credibility and develop the railroad he claims will be only for the public good, he needs to resort to further lies and even blackmail. Rosmersholm is a penetrating tale of guilt and desire, of politics and personal morality as two women fight to the death for the soul of John Rosmer, the spiritually, intellectually and emotionally bankrupt last of the line in the house of Rosmersholm. In what is also a ghost story, the house itself becomes a major character, a place where white horses announce impending death. With its depth of psychological analysis, the play seems ahead of its time — Ibsen explored the realm of modern psychiatry years before Freud’s major works. Little Eyolf fuses naturalistic style with supernatural elements. The dramatic death of their only child Eyolf triggers devastating confrontations of guilt and recrimination between Alfred Allmers, a self-absorbed man filled with grandiose ideas about his mission in life, and his wife, whose wealth has brought him security in a marriage of convenience. 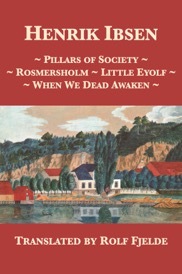 When We Dead Awaken, Ibsen’s last work (1899), completes the twelve major prose plays that assured his reputation as the father of modern drama. It is the final reckoning of the price an artist and those close to him pay for the artist’s dedication and devotion to his art. Rubek, a successful sculptor at the end of his career, desperately tries to rationalize his life and his work to his former model and muse.